2019 SCHOOL SHED PROJECTS and RAFFLE ! Putnam County Habitat for Humanity is excited to announce a collaboration with the students of Miller City-New Cleveland and Continental Local Schools. The Miller City-New Cleveland Vo-Ag and the Continental Industrial Technology classes are partnering with Habitat, in building 2 storage sheds, similar to the attached photos. These sheds will then be raffled off, with the proceeds to offset the project, as well as going to current and future Habitat projects. The students and their teachers are leading all phases of the construction projects, including: design, budgeting, estimating, and building. The students will, also, be gaining academic credit for class requirements. Tickets will be sold at upcoming home basketball games at Miller City and Continental. Additionally, Habitat Board members, students, and some area businesses will have tickets. The sheds will be 8' x 10', have 1 roll up door, a window, asphalt shingles, and siding. The 2 winners will have choices for exterior color, as well as grey or black shingles. Please help support the students and your local Habitat affiliate! Putnam County Habitat for Humanity continues to grow and expand our opportunities in Putnam County. In addition to our new home projects, and our Critical Home Repair Program, we are excited to announce a home Rehab project for 2018-2019. 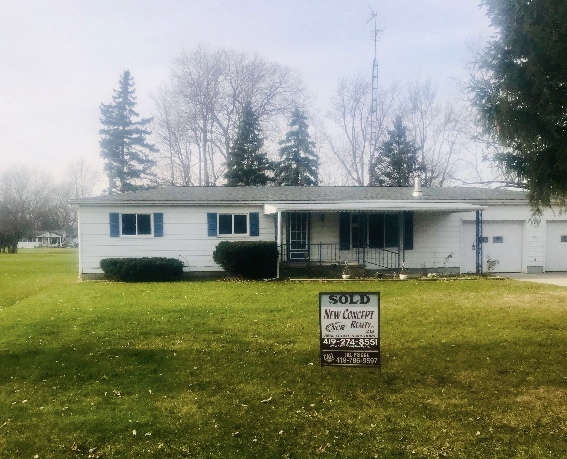 A home has been purchased in Continental and will be an extensive renovation project, including new HVAC, electrical, drywall, flooring, and etc. A partner family has, also, been selected and will be introduced at our December Board of Director’s Meeting; stay tuned to the website for this information. A huge THANK YOU goes out to Jill Prigge of New Concept Realty. Our affiliate works hard to meet the needs of our applicants, as well as being mindful with our resources and partners. As our affiliate moves forward, it will consider new home builds, as well as Rehab projects. If you have any questions, or would like more information, please contact our Office at 419-523-9621. Check back to our website for Rehab updates, or follow our Facebook page, Putnam County (Ohio) Habitat for Humanity. Chas and Beth Myers have been named the recipient of the 2018 Ohio Habitat for Humanity “Lifetime Achievement” award. Chas and Beth have been, and continue to be an important part of our Putnam County Habitat family. They have given countless hours of their time and creativity to help our affiliate begin………….and grow. It was an honor for us all to see them receive their award at the 2018 Ohio Habitat for Humanity State Conference. Chas and Beth Myers (front-center) with other affiliate friends, staff, and board members. We build strength, stability, and self-reliance through shelter. Many thanks go to Whirlpool Corporation--and especially our Ottawa Plant--for partially sponsoring the 2017 new home build and providing lots of volunteers! With God’s grace and the cooperation of people from all walks of life, Putnam County Habitat for Humanity partners with families in need to build, own and maintain simple, decent, affordable homes, all for the purpose of strengthening a sense of community. Information about this new program is included on the Critical Home Repair page!